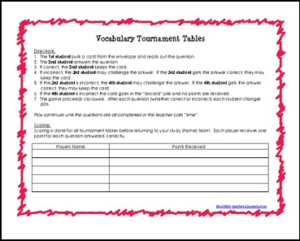 These are student directions for tournament game tables (TGT) for weekly vocabulary study. Students learn the material in class. The teacher divides students into home teams where they study. Then students compete in homogeneous groups for “points” to bring back to their home team. ← New Interactive HTML5 Science Lessons!